-Each player takes one game board. 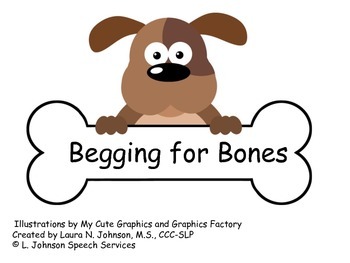 -Mix up the dog bones and place them face down in the dog food bowl (page 18). -Take turns picking a bone from the food bowl. -The student or the speech teacher reads the word out loud. 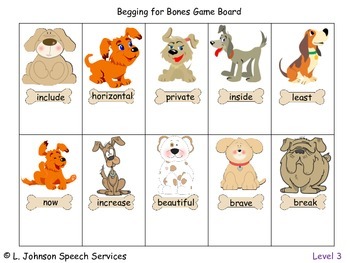 -If the student has the opposite word on his/her game board, then the bone is placed under its opposite, and the next player takes a turn. 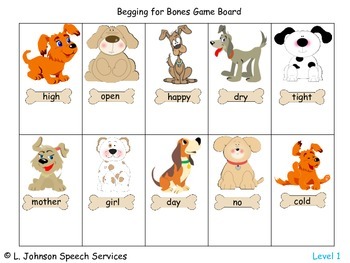 -If the student doesn’t have the opposite word on his/her game board, then the bone is placed back in the pile, and the next player takes a turn. -The first player to find all 10 opposite bones on their card is the winner. 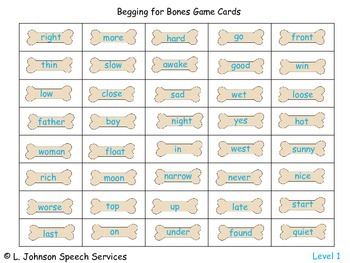 Play again another way: If the player can’t match their bone to an opposite on their card, another player can “steal” their bone, if they have the matching opposite.